Info: A Tibetan mother named Rinchen self-immolated near a military camp in the vicinity of Kirti monastery in Ngaba (Chinese: Aba) town in Ngaba Tibetan and Qiang Autonomous Prefecture, Sichuan (the Tibetan area of Amdo). Rinchen was in her early thirties, and was married to a Tibetan man who had died (details of when he died and the circumstances are not clear). It could not be immediately confirmed whether she had three or four children; the youngest was several months old, and the oldest in their early teens. According to Tibetan monks from Kirti who are now in exile, as she set herself ablaze, Rinchen shouted "Return His Holiness to Tibet" and "We need freedom". She died soon afterwards, according to the same sources. 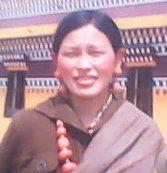 Rinchen was the eldest of eight siblings in her family, from Jiashang township in Ngaba.